I suppose most of you have watched Chelsea’s defeat against Barcelona yesterday. And you might have noticed this small 18-years old Argentinian playing on the right of Barcelona’s attack. What’s his name? Messiah? Messia? Messi? Yep! 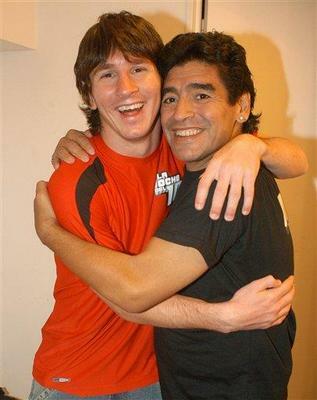 Let me introduce to the world Lionel Messi shown above with Diego Maradona. Mark my world, Lionel Messi will become the world’s best football player very quickly! Bienvenue Lionel. Concerning the cartoons, personally, I think that things has been blown out of proportion. 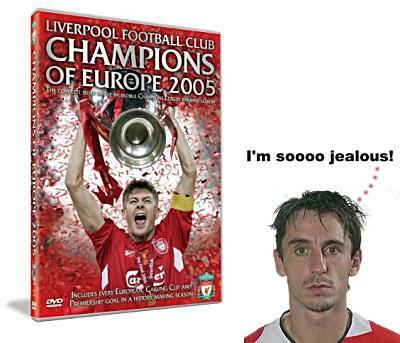 He hates scousers, scousers hate him! That’s why Liverpool will beat the scums 2-0 today. This match is actually the scum’s biggest match of the season and they’ll have all the pressure (especially our friend pictured above). 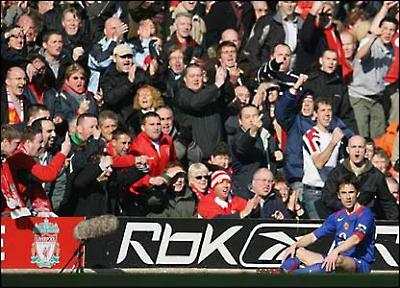 This is a nice shot of our appreciative Liverpool fans singing “Happy birthday” for the scum captain. By the way, Liverpool has won by 1-0! And the scums are out of the FA Cup!